We’re excited to introduce Sound Shield™, our newest sound-dampening glass package designed specifically for the Mid-Atlantic climate. Sound Shield™ is another innovation by Thompson Creek. What began as feedback from our customers became a challenge to innovate and make our existing windows even better. Our customers were consistently telling us that their homes were quieter after their Thompson Creek windows were installed. Each time we installed windows, we heard a resounding response that homes seemed quieter with our windows. Our engineering team in Upper Marlboro took that feedback as a challenge to help homeowners keep even more exterior noise outside, regardless of whether they lived near an airport, a highway or a grassy field – and we were successful! A third party lab test demonstrated that our noise-insulating Sound Shield™ glass can reduce the impact of external noise by up to 35% compared to our existing windows. It may be even higher depending on the nature of the windows in your home. 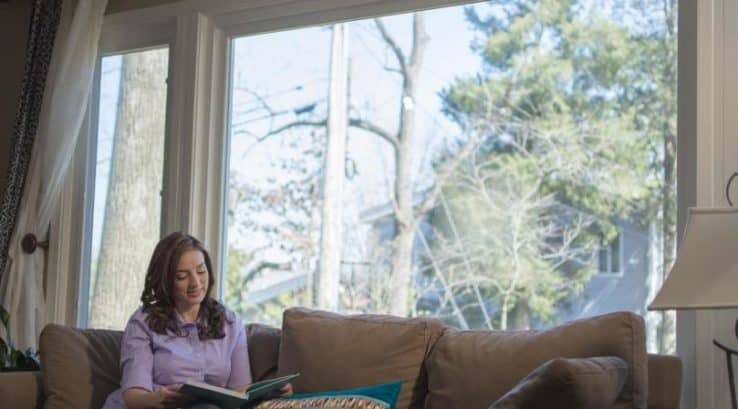 Since Sound Shield™ is available on our Premium Windows, which means you can find all the great benefits of our vinyl replacement windows in addition to the Sound Shield’s noise resistant advantages. Here are five tested and true reasons to choose Thompson Creek windows and the Sound Shield™ glass package. Absorbs outside noises, creating a quieter living space. Our windows are made with the highest quality vinyl and glass so they’re durable and hassle free. Our certified installation teams make sure every job is done right. Our honeycombed frame design provides superior strength, insulation and energy efficiency. Our windows are manufactured to withstand Category 4 hurricane wind speeds and rainfall. We debuted our Sound Shield™ windows at the Capital Home Show in September and gave potential customers the full Thompson Creek experience by inviting them into a tiny home. The home showcased our Sound Shield™ windows, along with our roofing, gutters, siding, and front door. Our visitors immediately noticed the difference between the noisy activity on the outside and the quiet calm of Sound Shield™ inside. In fact, the booth made such a big impression that we won Most Improved Booth from the Capital Home Show judges. Thanks for pointing out that blinds and shutters reduce the sun’s glare by being tilted. I guess I will choose this for the living room area. This is because it faces the sun when it sets which means that the heat is hotter at that time of the day.